FAQs for Solicitors and New Home Owners – Kirby Fields Roads Fund Ltd. The Conservation area of Kirby Fields, situated within the village of Kirby Muxloe, consists of a range of residences which are accessed off the main B5380. The roads within the Kirby Fields development fall into two categories; adopted (maintained by the Council) and unadopted (not maintained by the Council). As the Kirby Fields area grew and new residences were built, the roads within some of these developments (the side roads) were adopted by the Council. However, virtually all residents can only gain entry and exit access to their properties by making use of the unadopted roads, since each entry road into the estate falls into the unadopted category. It should be noted that it is not only the residents themselves who make use of the unadopted roads, but visitors, essential services and in times of crises the emergency services. It is therefore in everyone’s interest that the roads are maintained to the best possible standard that funds allow. The upkeep and maintenance of the unadopted road therefore falls to the local occupants. For many years a voluntary committee (Kirby Fields Road Fund Committee), made up of local residents, has administered the unadopted roads. Funding of such maintenance has been through the collection of an annual fee from the householders. After approximately 25 years as a voluntary organisation, KFRF Ltd was incorporated on July 22nd 2005. It is a Private Company, Limited by Guarantee and is non-profit making. Currently, those householders who live adjacent to an unadopted road pay £60 per annum, whilst those who live on an adopted road pay £30. Accounts: These can be accessed from Companies House. Why should I contribute towards the upkeep of the roads in Kirby Fields? All householders on unadopted roads in Kirby Fields own the part of the road adjacent to their property up to the middle of the road. It is the legal responsibility of the householder to ensure that their bit of road is safe and not a hazard to pedestrians, cyclists and motorists. Householders could be sued in the courts if someone has an accident on their property and it is shown that they are responsible. Most people have household insurance to cover this liability, but householders who live on an unadopted road are urged to make their insurer aware. The Road Fund does not take over this legal duty, but helps by maintaining the unadopted roads. 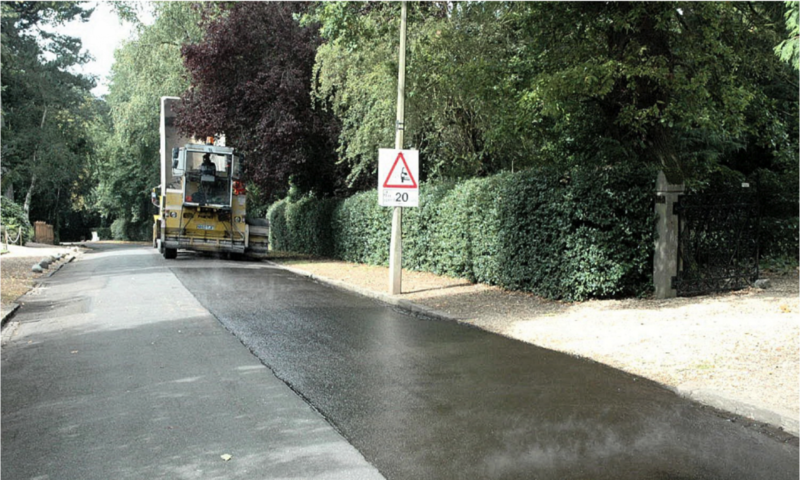 Also, it is very difficult for a householder to persuade a contractor to come along to repair a small piece of road surface – it is much easier when there is a larger amount to be done. What happens if a Householder does not pay their annual voluntary contributions? I do not own a car, but my neighbour has three cars. Why should I pay the same amount towards the upkeep of the roads as they do, when they wear them out and I don’t? Although some householders do not own a car, they and their families are likely to walk, cycle, push prams etc. along the unadopted roads and they will want to do this in safety (i.e. no pot holes to trip them up, or damage their bike/pram). They will also have friends, family, workers, delivery vehicles and the emergency services etc. using the unadopted roads to reach their property. I do not think that I get good value for my Road Fund contribution. The Road Fund was launched almost 40 years ago to improve the surface of the unadopted roads in Kirby Fields, which at that time were not made up and were muddy and full of dangerous potholes. All householders paid a large one-off lump sum into the Fund so that the roads could be properly surfaced. In order to keep the newly surfaced roads in good order it was agreed that each householder in Kirby Fields would pay an annual contribution, rather than having to pay a much larger amount whenever the roads needed repairing. The road outside my house has not been repaired very much, while other people living further along the road have had the road outside their homes repaired much more frequently. Why should I contribute when I do not have any work done? Some householders may live on part of the unadopted road which gets little traffic therefore their bit of road does not wear out quite as much. However, contributions are for the overall maintenance of all the unadopted roads within Kirby Fields. Householders would not be happy if they had to drive over potholes to reach their houses, even if their bit of road was in perfect condition. They are contributing so that the whole of Kirby Fields has a decent road surface. Why do householders living on adopted roads have to contribute to the Road Fund? Those living in the adopted roads (e.g. Rosendene Close) have to travel over the unadopted roads to reach their homes; therefore it is only fair that they contribute towards the upkeep of the roads they use. Incidentally, Blaby District Council is the only local authority that we are aware of which allows new housing developments that can only be reached via unadopted roads! If Kirby Fields residents want to prevent their roads being damaged by contractors’ vehicles, they will have to object to the council whenever there is a new planning application. The roads in Kirby Fields have a number of patches – when can we expect to have a full tar and chip surface? The last tar and chip was in 2007 and the roads have been kept in good condition with frequent repairs in the interim. The state of the roads is under constant review and a complete tar and chip will be considered when it becomes necessary. My house faces onto an adopted road or a main road and although one side of my property is on an unadopted road, I do not have an entrance or driveway from my property onto the unadopted road, therefore why should I contribute to the road fund? As already explained, householders own half the unadopted road adjacent to their property and are therefore legally responsible for its upkeep. It makes no difference whether or not they have access to the unadopted road or even use the unadopted roads in Kirby Fields; they are still liable for their part of the road and therefore liable to contribute to the Road Fund. What happens if I fall behind with my Road Fund contributions? It is in each householder’s interest not to fall behind (see following questions). A record is kept of payments received and owing. Householders behind with contributions can catch up with missing payments at any time. I put my house on the market and my solicitor asked me to complete a form, which asked if there was a Road Fund or similar organisation operating in this area, and also asked if my contributions were up to date. Why? Everyone selling a house must complete this form, which is why it is important to keep Road Fund contributions up to date. See next question for further information. When my house was for sale, the purchaser’s solicitor contacted the Road Fund to check if my contributions were up to date. They were, but what would have happened if I had not paid them? Because of the extra paperwork involved, the Kirby Fields Road Fund now makes an additional ‘enquiry fee’ charge of £100 to the solicitors of those vendors who are behind with contributions. There is no charge to those whose payments are up to date. Although Road Fund contributions are ‘voluntary’, because of the new house sale form and solicitor’s enquiries, contributions have become compulsory when properties change hands. It is in all householders’ best interests to keep their contributions up to date. What would happen if many householders refused to pay their contributions? Why can’t the unadopted roads in Kirby Fields be adopted? The Kirby Fields Road Fund asked Leicestershire County Council this very question in 2002. We were informed that the County Council had no plans to adopt any of the unadopted roads in Kirby Fields. We were informed that, if the roads were to be adopted, the carriageway would need to be 5.5m wide and pavements 1.8m wide on each side of the road. A turning head would need to be provided at the end of Portland Road and the visibility splays on other roads would need improving. In order to do all this, land would have to be taken from gardens. Trees and hedges would be lost and the character of Kirby Fields changed irrevocably. There would also be a very substantial financial cost to householders. Although some householders might prefer the roads to be adopted, it appears highly unlikely that they ever will be. Do the Directors of KFRF Ltd receive any remuneration? No. All of the Directors give their time totally free of any financial consideration. What is the basis for the proportion of expenditure to be borne by any individual property? It is based upon practicalities. To calculate a Householder’s proportion of expenditure based upon each Householder’s frontage dimensions, would be complex and hugely time consuming for a voluntary organisation. Furthermore, such a system does not take into account the road usage by those Householders who live in the developments off the unadopted roads. It was decided that the simplest method was to charge a fixed annual voluntary contribution per Household. Is there a right of way over the unadopted roads? Yes. The public have unrestricted access to utilise the unadopted roads. Why do the owners of properties in the un-adopted roads retain legal responsibility for the part of the road that they own (outside their property, up to the centre line)? All Householders are legally liable to ensure that any property that they own is not a hazard to other people or property. Householders on unadopted roads must therefore ensure that the road that they own is safe. Does KFRF Ltd also maintain the drains, gullies, pavements, road sub-structure, trees/hedges and street lighting? No. These are all the responsibilities of the Householder except street lighting, which is the responsibility of the Parish Council. What are the benefits of having a Road Fund? Easier and safer to walk, cycle, drive, push a pram etc. The emergency services and delivery companies can safely access your house. A reminder that the Road Fund’s remit is to keep the road surface in as good condition as possible within its financial limits. It is only the road surface that is covered by Road Fund contributions – not pavements, verges, drains, street lamps nor the ground underneath the road surface. Also, the Road Fund will not become involved in supporting or opposing planning applications or traffic matters. And finally – the KFRF directors appreciate your support and co-operation in helping us to keep the roadways safe and in good condition to the benefit of all local residents.